The Ford Focus competes with the Honda Civic, Chevy Cobalt, Toyota Corolla, and Mazda3 among many others in the red hot small car market, and is available as both a four-door sedan and two-door coupe. Under the hood, the 2008 Focus is fitted with an efficient 2.0 liter inline four cylinder engine rated at 140 horsepower and 136 foot pounds of torque. The EPA gas mileage estimates for the 2008 Ford Focus come in at 24 city / 33 miles per gallon (MPG) highway, when equipped with the automatic transmission. The Focus clearly rewards those who conscientiously drive with a light foot. When the need arises to mash the throttle, the Duratec engine delivers smooth and adequate acceleration. The Focus is a cool ride, geared towards youthful drivers of all ages. Friends will welcome the roomy (for a compact car) back seat and marvel at the color changing LED interior accent lighting. There’s no question that the Microsoft Sync audio system is the star of the show, providing drivers with complete control over a music library without lifting a hand from the steering wheel. The Instant MPG dashboard display provides real-time feedback on driving efficiency. 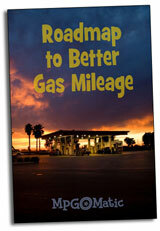 With just a bit of practice, you’ll learn how to drive the Focus for the optimum fuel economy. The Instant MPG display’s digital bar graph simplifies the task … maximize the number of bars and you’ll minimize the amount of fuel used at any given moment. The more proficient you get, the more savings you’ll accumulate. While there are nits to pick — most notably, the lack of four-wheel disc brakes and lesser performance than the European Focus — the domestic Focus remains a solid ride for the economy minded. All-in-all, we found the Ford Focus to be an solid choice for folks in search of a reasonably priced small car with excellent mileage, trendy styling, and a very cool sound system. With the Focus, Ford is touting the MPGs along with the MP3s, and we couldn’t help but agree. My 08 focus is getting me 35 to 36 mpg combined.If I just drive it in the city I am getting 29mpg assuming the mpg display is correct which I think it is.I can go 457 miles on a tank of gas but I fill up when it gets down to a 1/4 of a tank.Best part is it only takes 8 gal. to fill from a 1/4 tank and gas being 3.75 a gal it costs $30.00 to fll compared to F-150 it cost $63.00 to fill.Ford has a fine car here and I recommend it to anyone looking for an economy car. We are a Ford Focus Family! My husband and I own two, and they are the best running cars that we’ve had. They are great on gas, dependable and look good too! I own a 2008 Ford Focus that I’m very happy with, although I can’t figure why I can’t purchase the Ford Focus with your Diesel Engine. Why is it only for sale overseas? Do I have to go overseas to purchase one, then ship it back? What’s wrong with this picture? 57MPG. American consumers should have a choice. We recently rented a four door automatic transmission Ford Focus for a trip through the Colorado Rockies, topping out one day at 12,100 feet over Independence Pass, but also a fair amount of miles on four lane Hwy 82, as well as I-70. Returning to Grand Junction, after 462 miles, filling the tank required 10.89 gallons. for 42.4 mpg!! By contrast, my last local mountain trip, up to Glacier Point and back, in my 2000 Volvo V70 generated not quite 27 mpg, and that was driving by myself, not with my wife and four suitcases. The only way I can imagine the Focus getting over forty mpg is if You’re coasting downhill with a tailwind. I’ve got about 6K on mine and I actually hit 39.9 going downhill with a tailwind into Cincinnati at 68mph and getting on the X-way half a block from the filling station. Yes it does exceed the sticker numbers. I average 32mpg on 18 mile round trip to and from work on secondary roads, and on a trip with the car pretty well loaded, I can manage about 37 mpg, so I’m quite pleased. I just find it extremely hard to believe the numbers above. I like challenging myself to beat the numbers displayed for mpg from tank to tank, and drive as conservatively as possible in the quest for better mileage. 40 MPG isn’t possible unless You can find a way to drive downhill both ways, with a tailwind in both directions every time You get in the car. Of course there’s always drafting semis at twenty feet. The mythbusters proved that works if You want to get yourself killed. @Larry – It sounds like you’re rather close to our numbers, but here’s the question that needs to be asked … what percentage of your time behind the wheel is spent with your foot completely off the accelerator pedal? Once you grasp the technique your numbers will climb. I was driving home today from work and achieved 40.4 miles per gallon. Pretty good. I’m impressed for now but will see if it stays consistent. I keep the vehicle weight down, tires at 40psi, coast into stops with the transmission in neutral, don’t use the heater until the engine is up to temp, no airconditioning, accelerate gently and shifting at 1500-1600 rpms and I get mpgs in the upper 40s. This is average speeds of 40 mph or so. On level ground at sea level you will get 41mpg at 55mph,38mpg at 60 mph, and 35mpg at 65 mph. I have gotten as high as the mid 50s playing all the tricks but it is not a practical way to drive (level ground no wind). The easy way to get your mpg up is stay in the highest gear possible, (I am in 5th at 27 mph), very light acceleration, and shift out of gear (DO NOT HOLD THE CLUCH PEDAL DOWN except to shift out or into gear) and coast into a stop. Time lights so as to save energy. This saves alot because the engine drops to idle rpm and also is not a retarding force. These numbers are with 10% ethanol fuel. Physicist and test pilot background. Anybody can get 35mpg in this car, 40 is relatively easy, anything above 45 takes thought and effort. I would like to add to my previous post that coasting in neutral can only be considered with a manual transmission. You are going to shift to neutral anyway when you come to a stop so just do it early if you don’t need the engine braking. In my opinion it is very very bad idea to go to neutral and back in gear with an automatic while the vehicle is in motion. You can damage the transmission and/or have an accident. Again, an automatic should only be put in gear with the engine at idle speed and the vehicle completely stopped. I bought a new Focus back in 2003 and have 130,000+ on the vehicle. Thus far I have replaced the Pirelli P-6s and the brakes and changed my oil at regular intervals. I am retired and drive considerably less than in my commuting days but recently, I drove a friend to and from work or 200+ miles per day for two weeks. I averaged 38 MPG despite driving in excess of 65 MPH and being caught in the usual commuter traffic tie-ups. The total cost of ownership of this vehicle is substantially lower than any of the popular Japanese models. 2000 Ford Focus 178,000 miles,In 9 years I have changed oil every 4000 miles and used nothing but full synthetic.Changed all filters and other fluids at fords recommended intervals.I have only had to replace the alternator and the front struts,besides normal things like tires and bulbs.It is still turning out 33 mpg average(automatic,no A/C,no power accessories,everything simple) .It’s a great car and i will be getting another if this one ever dies,or the sheet metal falls off the still running drive train,seriously,You cant kill ’em. Ford… the best car company ever. Has any person ever seen an individual driving a Toyota or a Honda that is more than 30 years old… I dont think so. @Denny, not every car from every maker is going to be perfect or always reliable. The Focus you had may have been a one-off. Stuff happens. I’ll stand with those in support of the Focus. have a 2003 ford focus zx5 (auto) driving 90-100km per hour will get me 39 – 43mpg best of 44, driving 120- 130km per hour will get 31-33mpg. 122K on the car, change upper O2 sensor , IAC sensor and couple front end parts. Pretty cheap for all the parts. I have been able to achieve 38mpg over the tank on my 2004 ZX5 5 speed manul, with the 2.3 Liter Duratec engine. This was going 65mph 70% of the time, 20 mile highway commute typical. I have done this numerous times, but this was with a Cosworth Cold Air INtake in place, which I have since removed, and now only am getting 34-35 mpg doing the same. I am currently looking at an 08 Focus and took it out for a drive. I loved it but I’m not to sure if it will perform the tasks I would like it to. We have a club here in town that sets up time trials racing in our stadium parking lot and I was wondering if anyone would be able to tell me if it would be able to handle tight fast corners, hard launches and hard breaking? Have a 2002 Focus ZX5, with 125,000 miles and am only getting around 24-25 mpg highway. RPM’s are running at 3000 @ 70mph. Is this right? @Todd – 24-25 highway sounds low. Is this recent (winter driving) or is it the same in warmer weather? Are you running with the cruise control on or off? When was the car serviced last? Little things can add up (check the tire pressure), but 24-25 is a considerable drop from spec. My 2003 Ford Focus Wagon consistently got 34 mpg the first 7 years. I’m at 100K miles. In the last + year, the mpg dropped to 25-28. I’ve obsessed with the loss. I’ve taken it to the same mechanic since birth at the slightest sneeze and change the oil/filter @ 3K. Recently, I got new tires, the fuel injectors clean (moto vac), new spark plugs, air cleaner and am still at 25 mpg. What else should I try? @Susan – Two quick ideas … Has your daily routine changed, by chance? Are you driving in more stop & go traffic? I just bough a 2000 SE with 52k. after paying $150 per tank full of diesel in my 99 F-250 SD, I almost had a tear in my eye filling the Focus @ $ 37.00. I am looking forward to a fast pay back and the Michelin tire performance. The last skate board was a 72 Pinto. Having a bit of a culture shock along with flash backs. Cool! So it’s been about two years and nearly 40K more miles on my Focus. I still say it’s not practically possible to get more than 40mpg. OK you can do all the questionable tricks like putting car in neutral, drafting semis, driving 40mph on highways where flow of traffic is 70 or more, but in real life I smile when I get 38 mpg on a trip at highway speeds. I’m still averaging better than 31mpg on weekly driving to and from work and around town. I just bought a 2009 Ford Focus 2door, 5speed,only 32,000 miles. And I am in love with this car. Not only does it drive, and corner like a dream, but the gas mileage is amazing. I am literally getting between 25-28 mpg in city, if not more. And highway between 38-42mpg. I love the way it handles, the way it looks, inside and out. This is a car I would definatly recommend to anyone. It is the perfect car for me, its affordable, and unlike other vehicles I have had in the past, this is by far the best car, not just the gas mileage, but the way it handels, and all the extras. I love it! With any car you purchase, I always get the warrenty. It of course costs a bit more, but will save you in the long run.